#BajrangiIsComingHome: Social media marketing extending a movie's lifespan? 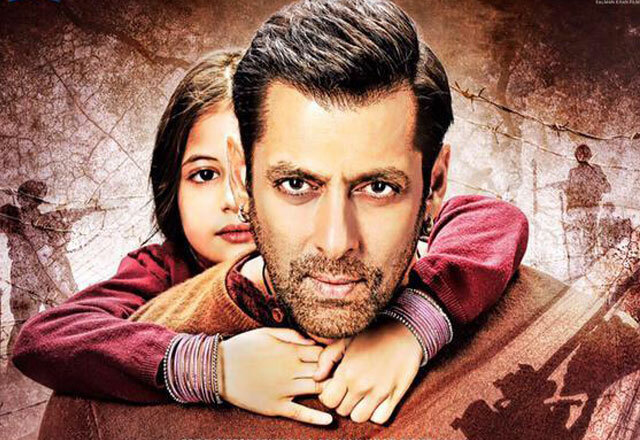 #BhaijaanIsComingHome: Social media marketing extending movie’s lifespan? When a Hanuman devotee crossed the barbed wires to help a six year old get home, it brought with it a warm fuzzy feeling across borders amongst millions of families. With Bhaijaan world premiering on Star Gold, Social Kinnect decided to relive the memories by celebrating Bhaijaan’s entry on the silver screen though a fun campaign. Activities across both platforms were carried out, under one big umbrella through #BhaijaanIsComingHome. The campaign targeted both Salman Khan and Bhaijaan fans, by reliving movie memories. The idea was create a grand welcome for Bhaijaan’s return. 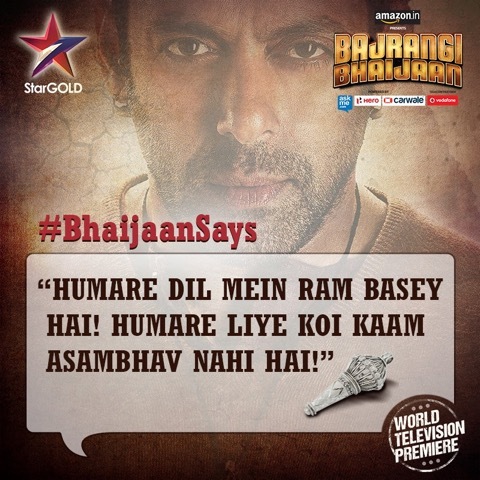 Another one talked about “Things Bhaijaan Fans will know” and the campaign wouldn’t be complete without reminiscing dialogues from this heart warming movie. Videos depicting a crazy fan’s excitement on Bhaijaan’s premiere on Star Gold were also created and shared across social media platforms. On Twitter, snippets from the movie were shared, reminding everybody to be tuned in for the world premiere. Also, a four day contest was rolled out, asking fans to send in selfies, which would then be digitised and aired during the movie premiere. The contest gathered at least 2962 entries while trending at the second place. The ripple created by Salman Khan through the family oriented film, managed to reflect across social platforms as well. Plus, the whole nostalgia element around the movie worked well with the fans. The one and the major difference between marketing a product and a movie on social media, is the extremely short shelf life, held by the latter. This often restricts agencies to pre – market the movie and a little bit during the first week after the release. Creating a campaign for a movie premiere not only extends Bhaijaan’s shelf life across social media, but also gives the investors a fair chance for brand recall and hence larger RoI. Investment in premiering a Bollywood hit on a television channel is huge. The stakes are set higher when the TRP competition is taken into consideration. For instance, in 2102, Salman Khan Starrer Bodyguard received a TRP of 10, followed by Singham and Ra.One on 8.7 and 6.7 respectively; while English Vinglish garnered 2 TVRs on Zee Cinema. This TRP race determines ad rates for the premiere of a particular movie to quite an extent – this making it very important for the channel to create as much buzz around the movie as possible. 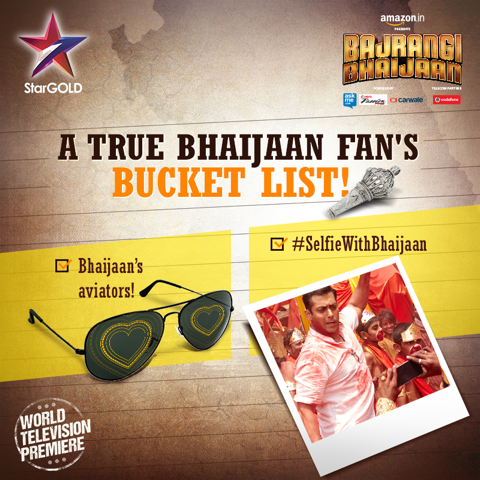 #SelfieWithBhaijaan ensured owners of the winning selfies tuning in to watch the premiere, to get a glimpse of them with the ultimate Khan on national television; leading to a spike in TRPs. According to data by Topsy, #BhaijaanIsComingHome managed to receive around 2000 mentions. A lot of these were posted while the audience was tuned in the film, creating a multi-screen impact. On a separate note, keeping the video format in mind the campaign probably could have been more interactive with a Dubsmash contest or a Snapchat story push. Nonetheless, the campaign managed to make Munni and Pawan household names once again with apt contextual marketing across social.